Grand Topal Hideaway is a player house reachable by boat from Fisherman's Isle. It is only available from the Crown Store. The house was added in Update 13 and was only available for purchase for a limited time, from April 27 to May 1, 2017. Grand Master Decorator 50 Decorate a home you own with at least 350 objects. 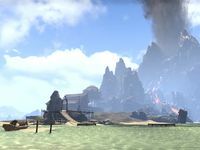 Although the island is accessed from Grahtwood, the Tamriel world map indicates that it's actually located off the eastern coast of the large island in Topal Bay. While discontinued from purchase, the house had an extremely rare chance to be found in reward boxes during the Ten Million Stories dungeon event. This is, to date, the only home which will earn you Grand Master Decorator immediately upon purchase if you choose the Furnished option. Even Unfurnished, it has enough for Journeyman Decorator and Conservatory Decorator.